It is impossible to imagine Venice without its canals. The reflective city, hovering over the water, never showing off its charm; the decadence of the Palazzos is tactfully displayed, like a trinket that is shown gracefully. It is this that causes the canals to be streaked with the reds and the gold’s of the ancient Palazzos, bridges and steps, as they have passed through them for centuries. Enjoy a romantic and charming tour in the heart of Venice! In a City born on a network of islands and canals, the art of building boats was vital. 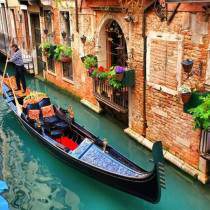 This typical Venetian boat called Gondola is now famous in all over the world. This tour will guide you trough all the small Rio in the heart of Venice. Don’t miss your romantic tour and discover the hidden treasure of the City.